Ive been writing in this small homey space in the internet since 16th November 2007, a 4 years plus spare time writing experience. If you read some of my early posts and compare it to my recent writings, theres a huge difference in the topic and writing style. Seems like my writing matured along with my personality. How cool is that ? this blog has become my time capsule. Facebook timeline may show how silly my face and appearance was back then, but this blog capture progression of my thoughts, point of view and emotion. Another strong reason why everybody should have their own blog. 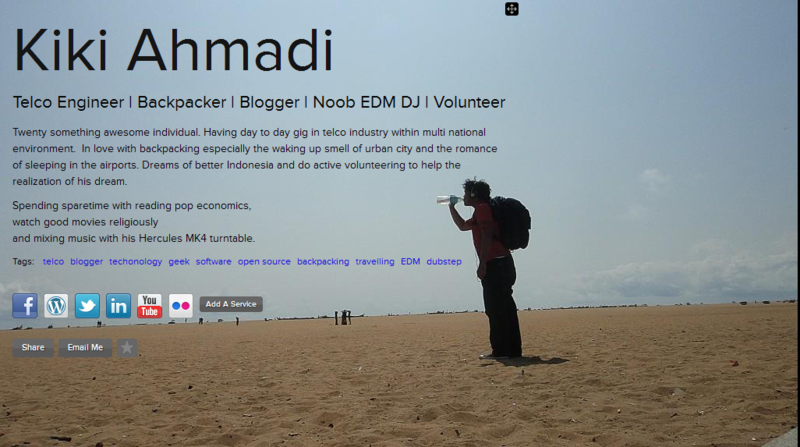 Now i decided to take this one step ahead, Linuxgembel blog is officially transformed to Kikiahmadi.com. Two reason why. First, one of this blog objective is a personal branding. Putting name on the URL on it will make this look more professional. Heres a good post on lifehacker that influenced my action. Second, its really easy to have my own domain name in WordPress. 17 USD per annum deducted from my visa and one hour later kikiahmadi domain name already activated in this blog. No frills, just thrills. Go here if you’re interested. Thanks for everyone who reads my blog, it really means a lot for me. Check out regularly for post about telco, travelling, volunteering or other awesome stuff. Also do have a look at my internet namecard here in about.me. Now if you excuse me, i will go have more amazing experience ahead so i can write more amazing stuff here.